video analysis with in-person training. 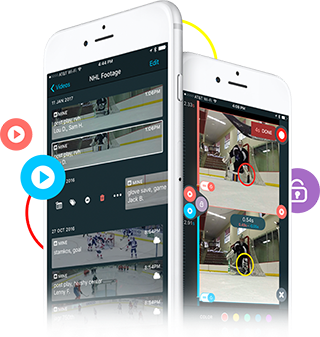 Upper Hand’s revolutionary APEX video analysis is an incredibly simple yet powerful video platform that makes capturing, organizing and sharing video fast and easy. With the platform, we give your players the ability to visualize their athletic performance in a way they’ve never seen before. And the best part? It’s all right there within Upper Hand’s sports software. The Upper Hand Save Review System is the world’s first video and analytic platform built for hockey goalies. Used by NHL level coaches and players to instantly review performance using data collected and analyzed by the APEX sports software system. Data access is instant and can provide a more comprehensive perspective of strengths and weaknesses to help your athlete improve. Add a new dimension to your performance perspective with SRS.